I'm switching things up a bit for today's #MonsterMonday entry. No pitfighting elemental beast for me today, although Tim at The Other Side has posted a great monster for 5E that may find its way into battle against the likes of the Quadropod and the Ohmadillo. Today, I'm letting my one-track mind keep me on the topic of daikaiju. Here's Gorgo's mother, aka Ogra, from the 1961 British monster flick Gorgo (which was featured on MST3K for one big day before the rights expired to it...and which got some tie-in comics from Charlton that apparently are in the public domain to stay). I'm building on the daikaiju as player character idea, so the stats here are from an imaginary giant monster RPG that plays a lot like the Basic Fantasy Role-Playing Game. Gorgo's mother (Ogra) is known for wreaking havoc on London in saving her son from his human captors. As an amphibious reptile, Ogra can breathe underwater and gets +4 to saving throws vs. atomic energy or paralysis. A Brawler, Ogra lacks any atomic or magical attacks but is able to apply her DEX modifier to all attack rolls. An ancient monster, Ogra has been somewhat weakened by her years of slumber. It is unknown how much strength she may gain after acclimation to survival in the modern world. Glad to see you keeping that kaiju love coming. I guess I tend to get a little...obsessed. I think it might not be too uncommon among us gamers...! Very cool! I love putting Kaiju in my games. So do my kids. Thank you for the note! I'm looking toward getting some new kaiju material posted soon! 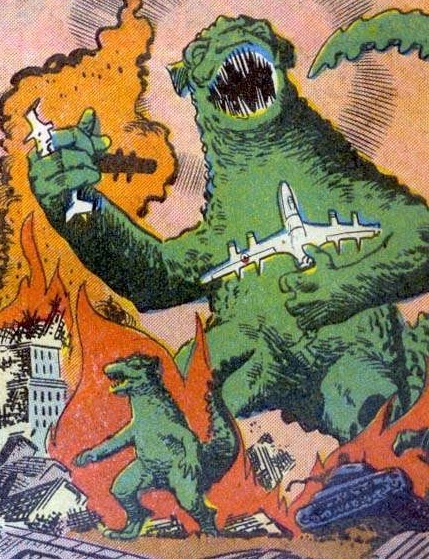 I apparently grew up in a wasteland of giant monster movies. I get jealous when my friends mention their Saturdays spent watching cities get destroyed, and I wasn't even aware of Gorgo until exploring kaiju more as an adult.